Here it is… February 5, 2015, and the once powerful Radio Shack stores has declared bankruptcy. It’s a bit surreal, but I suppose after the past decade or two, I’m not totally surprised. However, I can’t help but think back in retrospect as to how the chain of stores impacted me directly, and also my career. 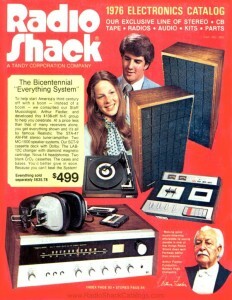 For me, the start of my familiarity with Radio Shack goes back to the mid 1970s. It was pre-TRS-80 days for the chain. My parents probably went there to get antenna hardware for their new house and took my brother and I with them. I was nearly nine years old at the time. There were no other stores, except for Lafayette Electronics, that would stock quality home television antenna systems. Those of you old enough know what I’m talking about. Large multi-element yagi antennas which get mounted atop a galvanized steel tower along the side of the house. Yep. Radio Shack was the place to get those. Fast forward about a year or two and I came across a “new” Radio Shack catalog. I believe it was the 1976 version, because it had the same stereo system on the front cover that my parents had in the family room. Well, being the curious little kid I was, I browsed through the entire catalog while listening to that stereo. Radio Shack was just a passing fancy for me until the 1978 catalog came out in September 1977 and I noticed something called a “personal computer” at the end of the catalog. “A personal computer?!? WOW!! !” Now, I was hooked on this store. Whenever we went to the mall, I would skip going to the arcade and head straight to Radio Shack to see this new TRS-80 computer. I really wanted one and thought (in my distorted perception of economic reality) that the $499 price tag was cheap! My Mom and Dad thought otherwise. Needless to say, I didn’t have any chance to ever own a personal computer in my lifetime. Still, there was plenty of other technology to feast my eyes on. It was around this time, late 1977, when I developed a keen interest in the electronics hobby. 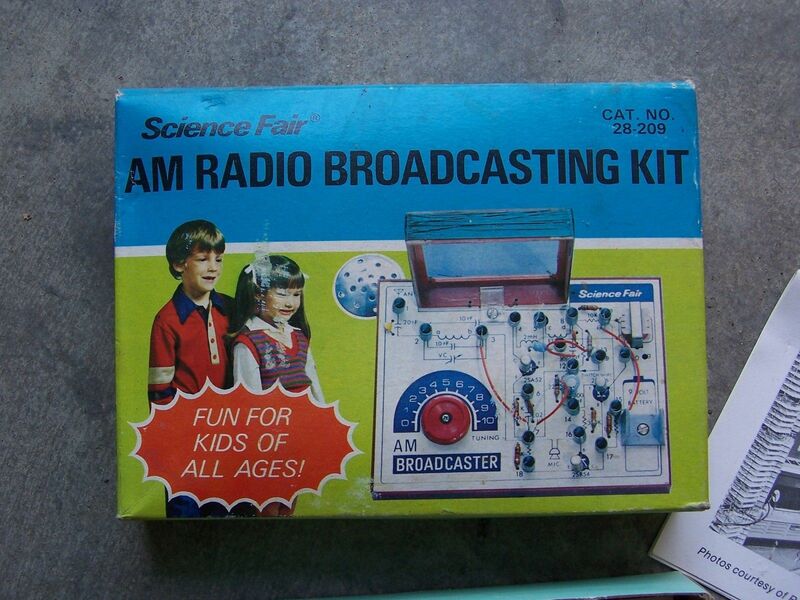 In October of 1977, I picked up an AM Transmitter kit. You can read about that story, here. From that point on, do-it-yourself electronics was my thing. I even went to the local Vo-Tech school during high school to train in electronics for a career. My spare money went into buying parts to build projects like a set of “Digital Dice”, or en electronic roulette game kit. I didn’t have a lot of spending money as a kid. Even a project case that cost $7.99 in those days would be difficult to get without saving any amount of cash I could muster. But still, it was (is) a fun hobby. This remained rather steady until I graduated high school and joined the Army. After my enlistment, Radio Shack was my go-to store for anything I might have needed that was related to audio, video, and TV accessories… and CB radio. I didn’t have the space to really continue an electronics hobby in the Army barracks. Radio Shack was kind of “just another store” to me. After my honorable discharge, I moved back home and had more time to pursue the electronics hobby again. 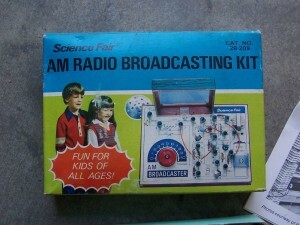 I did earn my HAM radio license while in the Army, but Radio Shack at that time had little support for the hobby. Ironic, since the HAM radio hobby was so instrumental in Radio Shack’s early growth. But, I was poor and going to college, and later, a trade school. I earned a two year specialized degree in electronics at that trade school. Radio Shack would become my parts source for most of the projects that I designed for class that were not part of the collection of kits paid for as part of school tuition. Outside of school, I couldn’t even afford to do much with the hobby. That still didn’t end my enthusiasm for what the store carried. Every time I went to the mall, I went into Radio Shack to see what was new. At this point of time so far, I’ve seen them go through the entire TRS-80 line of computers and begin to jump on-board the PC compatible bandwagon, plus witness the growth of this crazy thing called “cell phones.” In hind sight, perhaps that first marketing of cell phones slowly started nailing Radio Shack’s coffin closed. I also found myself interested in various radio technologies. I bought my first handheld scanner. Radio type, not image scanner. It was a Realistic PRO-31 VHF/UHF scanner. It was fun scanning up and down the frequency bands, listening to conversations from police, fire, and other emergency services. Sometimes, I’d run across some business communications, becoming privy to the occasional dialog involving nearby road crew activity or somebody in the main office at a warehouse calling for product pick-up. Plus, I would use the radio in my car to scan the HAM radio bands since my HAM radio was usually tuned to a single frequency I wanted to keep monitoring. Radio Shack was also the place where I bought the most expensive VCR I ever owned. 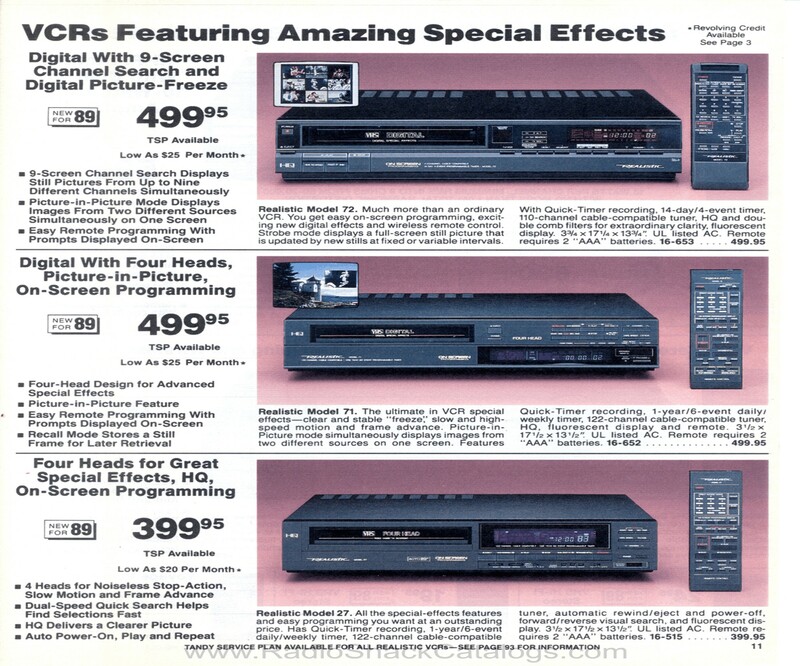 I remember being at work during my break, browsing through the new 1989 Radio Shack catalog when I came across the coolest VCR (of that era of consumer electronics). It was the Realistic Model 72. What made it so great is that it had a very clear freeze frame feature that digitally stored the frame. There was no static bands or artifacting that you would find in a conventional VCR that had a pause feature. At the time, I had a Commodore Amiga computer and a full color video digitizer. Grabbing images from live television was one of the coolest things to do in those days. I always had trouble scanning images from an NTSC signal on videotape because the regular VCRs didn’t have a steady signal when paused. Screen grabs like this were not instantaneous. It took 10 to 30 seconds to digitally grab a full color frame of video and store it on a computer. I called the nearby Radio Shack from work and found out they had just one in stock. The store closed before my shift was over, so I called my uncle to see if he could pick it up for me. I was impetuous like that back then. I HAD TO HAVE IT! The Radio Shack store manager allowed me to write and sign a letter authorizing my uncle to use my Radio Shack credit card to purchase the VCR. It cost $499 +tax and worth every penny of it to me! BTW, in case you were wondering, that uncle happens to be my age. We would usually hang around together, so I knew he’d be available to run that errand for me if I asked. The 1990’s arrive, and before long, I found myself having the opportunity to actually WORK at a Radio Shack store over the holidays. I actually became one of those people I had minor contempt for… a salesperson that will continually ask for your name and address, no matter how little you spend in the store! 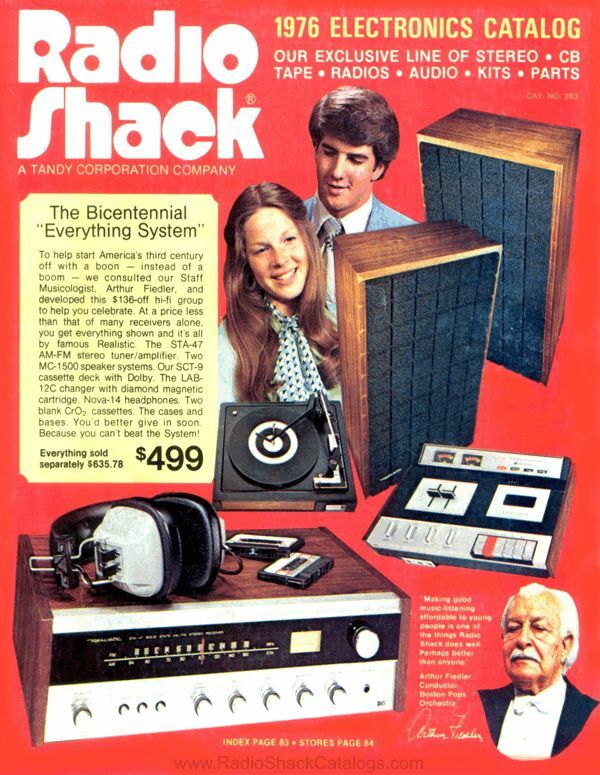 Hindsight moment #2: I believe Radio Shack dragged on that name and address thing FAR TOO LONG throughout the 20th century, perhaps discouraging many people from regularly patronizing the store. That would be me during weekends and evenings, sporting a shirt, tie, and slacks, keeping up the professional image Radio Shack shoppers always expected. I made sales. I made commissions. I helped close out the store each day. I even sold a couple of Tandy 1000 computers! But the one thing that meant the most to me was being able to apply my electronics knowledge when helping people solve problems. Whether it involved a customer needing help to connect all of their TV and stereo systems together, or helping a new electronics hobbyist get started in the world of DIY projects, I was appreciative of the positive feedback from those customers. It really does feel good to help others using your own knowledge. I didn’t stay long as a Radio Shack employee. My career wasn’t in sales. I worked the holiday season as intended and chalked up the experience. The 1990’s was a time where I got married and eventually had kids. I still pursued the electronics hobby, but Radio Shack’s purpose in my hobby was somewhat diminished. Over the decade, I noticed the availability of electronic parts at the store dwindling, even to the point where Radio Shack was slowly morphing into a “mail-order” center for even the most basic of components. If I needed batteries, or cables, or a universal remote control, I went there first because they still carried those items. However, there was no “logic” to the limited variety of TTL or CMOS integrated circuits in their everyday stock. My wife once helped establish her credit by opening up a credit card account to buy us a nice stereo amplifier for our home entertainment center. But other than that, Radio Shack’s impact on my life dwindled even further into the new millennium. By now, they published the last of their catalogs. For the last few years of the publication, they expected consumers to actually buy the catalog, while simultaneously offering a cash off coupon for the value of the catalog purchase price (about $3, I believe) to be applied to your next purchase. In the 2000’s, Radio Shack’s transformation to a “cell store” is all but complete. There was still additional footing for them to take hold of while the cell phone service companies were going through a number of merges and name changes. When that dust settled, Radio Shack was “Phone Shack.” I’ll admit, I even bought and upgraded phones there from time to time. They worked independently of service providers, meaning they were able to offer alternative deals to what the providers offered. To Radio Shack’s credit, they had some pretty good deals on new cell phones in store. Personally, I don’t believe it was any lack of interest in the hobby that kept Radio Shack from selling DIY kits that were actually GROWING in popularity at the time. I think the company simply failed to maintain professionalism and product expertise in the stores. When the average customer seems to know more than the average Radio Shack salesperson, something is WRONG! If you were a Radio Shack employee and you knew your stuff, kudos to you! I apologize for any perceived contempt. But I’m speaking strictly from personal experience. The employees didn’t even need to say anything to demonstrate the lack of professionalism. I walked into a local Radio Shack store recently, only to be visually greeted by a conspicuous set of cheeks. Right in the middle of the store, sitting on top of the sales counter with her back facing the store entrance was a salesperson with her pants resting half-mast. I’m not going to describe the sight in any more detail other than to call it “unprofessional.” Use your own imagination! 3 Comments to "Radio Shack: A Personal Perspective"
I remember going to Radio Shack with my dad to test TV tubes. They had a big tube tester machine with lots of different holes to stick the tubes into. Our old Radio Shack had a software store a few doors down that sold software in baggies. He would let you “test” the software for 25 cents for as long as you wanted. I played TRS-80 games there for hours and hours. Thank you for sharing those memories! I remember those tube testers. Never really used one myself back then, even though my first TV was a black & white tube based model. I outgrew that TV before the tubes even got close to wearing out. If I travel to another area can the PRO 31 realistic be reprogramed to that area. What is the cost and how can I order it. Can you have these scanners service if they break.